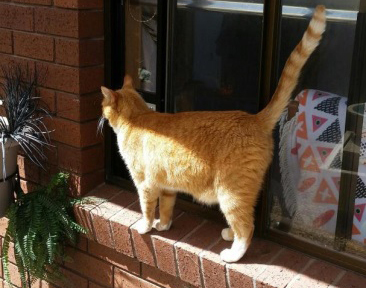 Council is offering assistance to Bruny Island cat owners to plan and build containment options for their cats such as enclosures, cat flaps and fence-top systems and also advice from an animal behaviourist about how to help cats make the transition. This assistance is part of Council’s efforts to help owners comply with the proposed Bruny Island Cat By-law. Below is Buddy’s story, who now lives happily in Alonnah after his owners had help with a new enclosure. Members of the Bruny Community are invited to give feedback on the By-law by Monday 11 March. Read the draft Bruny Island Cat By-law (PDF). Buddy was found as a kitten hiding in a shed near Alonnah. He was in poor condition and when Sue bought him home to ponder his future, she and Neil fell in love with him. Seven years on Buddy, who has always been a free roaming cat, is now enjoying his new cat enclosure. Pete Willows, who has been contracted by Council, worked with Neil and Sue to plan his new home. 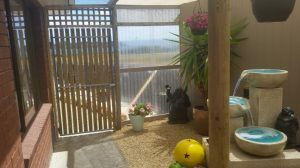 Neil clad their existing pergola, built a separate connected area for toileting and added a cat window insert into their sliding window. 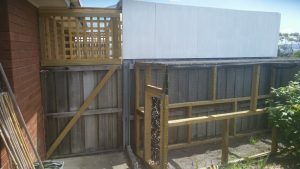 Pete then used cat netting to secure the rest of the pergola and installed gates. Buddy is now secure in the house and enclosure at night and during the day he often joins Sue and Neil while they are working in the garden. If you would like more information, contact Kaylene either via email at kallan@kingborough.tas.gov.au or on 6211 8255.